Feed Your Bacteria: First, be sure to add some bacteria enhancer, like EcoBoost , to the water. It binds suspended organics, provides trace minerals to fish and other pond dwellers, and helps break down fertilizers from rain runoff. It has no temperature restrictions, so you can use it throughout the seasons. A bubbler system, like the Shallow Water Series Aeration System, uses a diffuser to create water movement under the dock and prevent ice formation. Diffuser plates connected to an air compressor pump air below the surface and agitate the water. Multiple diffusers used together can create large areas of open water, particularly when they’re placed evenly across a small area in the shallow part of the pond. Another benefit: They cost less to operate than a motor and prop. Add Some EcoBoost : Formulated to bind organic debris suspended in the water, Pond Logic® EcoBoost helps to clear water and enhance beneficial bacteria. It also provides more than 80 trace minerals to fish, keeping them healthy over the winter. EcoBoost has no temperature restrictions, so you can use it all year round. Simply mix the powder with some water in a pail and pour it in the pond. Q: I heard you can lose fish during the winter. How do I prevent a winter fish kill? A: Imagine being cooped up all winter long in a room with no ventilation and no fresh air. Pretty claustrophobic, right? Now add the stench of decaying garbage and other waste buildup … it’s likely you wouldn’t last until spring. It’s a similar situation with your fish. In colder climates that freeze over the winter, decomposing vegetation and waste beneath the ice layer releases toxic gases that build up, displacing the oxygen that the fish need to survive. When that O2 is replaced with ammonia and other harmful gases, the result can be a winter fish kill. So how to do you prevent this from happening? Aeration with an Airmax® Aeration System. An Airmax® Aeration System sized for your lake or pond moves the water below the frozen surface, which keeps an air hole open in the ice. This ventilation allows the harmful gases to escape while bringing in fresh oxygen for your fish. The aeration also injects oxygen into the water via the bubbles that come out of the diffuser or air stones. For the health of your fish, we recommend you run an aeration system year-round—unless you plan to use the pond for winter activities, like ice skating or hockey, that require a solid and safe sheet of ice. In that case, follow the instructions in your product manual to safely turn off your system. If you plan to run your system year-round, move the diffuser plates into shallower water during the winter months. This will allow your fish to hunker down in your pond’s warmer depth for the winter. It will also prevent the rare “super cooling” effect, in which the water temperature dips below freezing and over chills your fish. 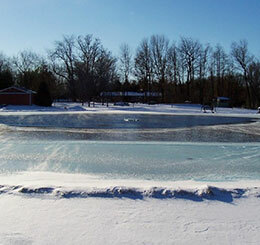 Pond Talk: Have you ever experienced a winter fish kill? What changes did you make to prevent it from happening again?